The middle child graduated from high school this year. Wow, I'm getting old! Right? Anyway: I've mentioned before that we're originally from Pittsburgh which is over an hour away. To make a really long story super short, we ended up with 2 graduation parties. 1 in Pittsburgh for the family, and a smaller one at home for the school friends. So we had a lot of work to do to make the 2 parties different, yet not blow the budget completely! It took a lot of planning but we were determined to make each party unique. 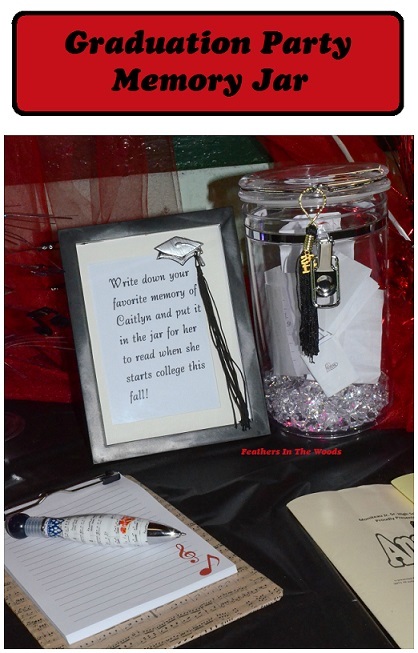 One of the ideas I saw during the planning process was a memory jar kit. 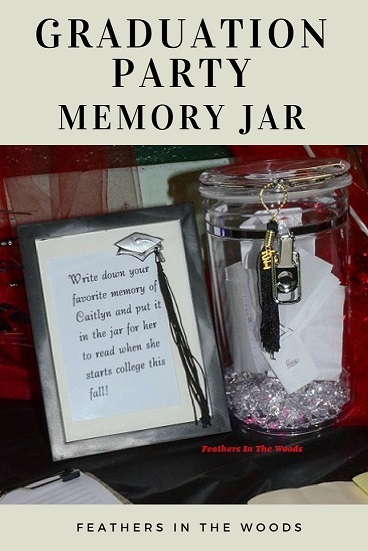 A plain thin glass jar with a cardboard plaque that said to write a memory to place inside for the grad. B-O-R-I-N-G! I took the idea and ran with it, hitting the Walmart and the Dollar tree for some supplies. I came away with an acrylic jar and a package of Everlasting Glow Water Lights for $5 from Walmart. I added a $1 Graduation frame and a $1 2013 cap tassel from Dollar tree. I wrote my own saying and printed it up at home for a much prettier display! I had bought a cute notepad for $1, but at the last minute saw a music note themed pen and paper for $2 each at Micheal's, so I bought those since she's a music student. This was much better then the plain but 'pre-made set' memory jar, after all it fit her personality better and was much cheaper! The battery operated light changed colors all day long inside the jar with the gems and suited her personality much better! She was super excited that she got to keep the notepad and pen afterwards too. Plus all the little notes everyone wrote for her were super sweet! On either side of the display I placed a dollar store vase filled with Orbeez clear water beads. I decorated them with some graduation ribbon and some musical note scrapbooking stickers. Once the sun started to go down I turned of a pair of Color Changing Submersible LED lights and put one in each vase. They spent the next few hours changing color and illuminating the table. I have to admit, it looked pretty cool. During the planning process daughter and I shared a group Pinterest board for graduation ideas. We made the candy/cookie graduation caps that are pinned on there. We had a candy table based on the schools color theme. We also have a few other ideas that we're still kicking around for the second party. While that party is over, the other one will be next month. 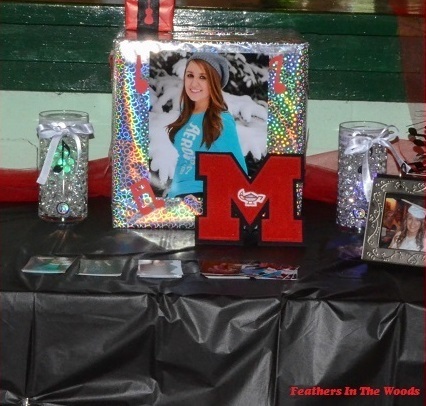 We still have the props...the memory jar, scrapbook and light up vases (I'll get into those on another post) but we need more ideas! We would both love it if you'd join us on the group board and pin as much as you want. We can't wait to see your ideas! While I did buy my items from local stores I provided links for the items on Amazon so you can get a better look at each individual item since I forgot to photograph the original packaging, If I find the color changing gems online somewhere I will link them also. The name brand is Everlasting glow and the package contains 100 acrylic gems and 1 submersible tea light. I hope that helps if you're looking for them. I love that idea. I think I may do this as a weekly or bi-weekly thing in my house. Then, at the end of the year we can go through it and enjoy our year all over again. Great idea.....that would be so much fun! Especially with younger kids!